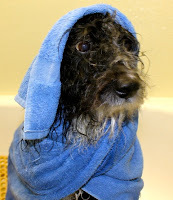 To Dog With Love: Happytails giveaway event: Pamper your dog in spa style! 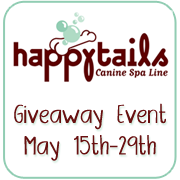 Happytails giveaway event: Pamper your dog in spa style! Welcome to the Happy Tails Spa Giveaway Event hosted by Two Little Cavaliers, and sponsored by Happy Tails Spa! Read all the way down to see how to enter to win LOTS of great eco-friendly dog spa products from Happytails. But first, this message from Cosmo Havanese. "Hmm, this does not smell like dog treats..."
Cosmo and I had the opportunity to take a few Happytails products on a test run. 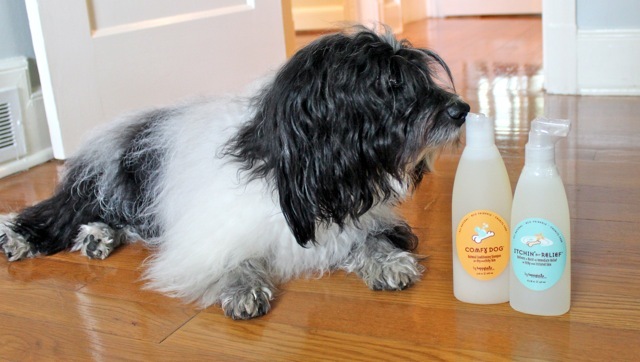 Because Cosmo is a bit of an itchy dog, we tried the Comfy Dog oatmeal conditioning shampoo for itchy skin and the Itchin' for Relief anti-itch spray. "Still waiting for my treats..."
Cosmo gets lathered up with Comfy Dog shampoo, with ingredients like colloidal oatmeal, peppermint, comfrey and calendula to sooth itchy skin. The shampoo smells like peppermint, but Cosmo simply smelled fresh and clean after his bath, not like a mint! For extra relief, the Itchin' for Relief spray features a unique "nozzler" that delivers an all-natural formula through the coat directly onto the skin. For a fluffy dog like Cosmo, this is extra important! 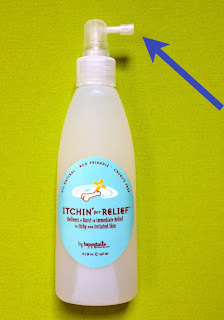 Itchin' for Relief contains neem, oat extract and aloe to condition the skin while litchi, grapefruit seed extract and calendula smell fresh and clean. I even tried some on myself! After using these products, Cosmo feels super soft and fluffy and he does seem to be less itchy. He also smells fresh and clean... and so do I! Check out the full line of products from Happytails and then head down to the linky list below to see all the great products offered in this giveaway event. "I'm fluffy again and ready for treats, please!" Enter via our Rafflecopter and then check out all the other participating blogs in the list below. You can enter on each blog for a chance to win even more products from Happytails! This giveaway begins on May 15, 2012 at 12:01am EST and will end on May 29, 2012 at 11:59pm EST. Disclaimer: Happytails sent us the products to test for this review. Our opinions are entirely our own. I love the little adorable puppy faces of puppies. There is nothing cuter, although I sometimes forget that because we have so many come in to the animal rescue. Puppy breath, and those innocent, eager-to-learn eyes just can't be beat! I love their little tails, ears and paws. They are so sweet too. I love the unconditional love Dumpling gives us! FYI - I signed up for the Happytails newsletter with my other e-mail address (julpac107 (at) gmail.com). My pets are good listeners! Aww Cosmo! What a great review. 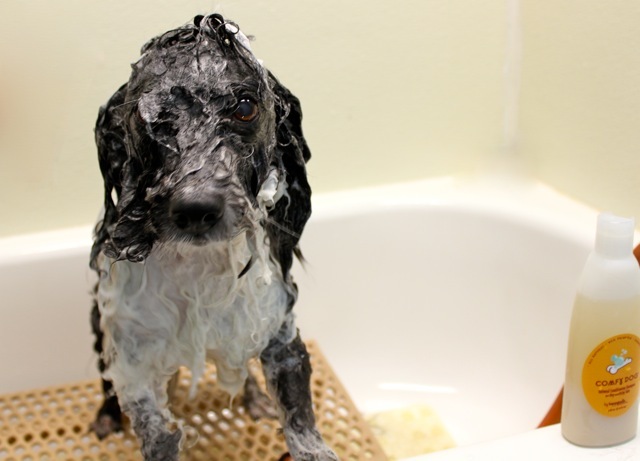 I can't believe you let your momma post a picture of you all wet and soapy like that! You do look super clean and fluffy after it was all over. Sending you lots of kisses. I love that my pets provide me with the love and companionship I am missing from humans. I love the way they all communicate with me in their own individual ways. I love that my dogs are so good and loyal. They will love you no matter what.. They are my spoiled babies. There is so much to love, but that mischievous look after he has done something wrong, gets me every time. I love everything about them. They have the sweetest personalities. I love my dogs so much! They all have such different personalities and they all make me laugh! I love that they love so unconditionally! I love how happy they are when I come home. There's nothing like seeing two of the happiest faces in the world welcoming me back from a long day at work. Both my Jack Russells are from unwanted homes. Well, they are welcome and loved in my home. They are a handful but that is part of their charm. The word 'NO' to a Jack Russell is just a challenge for him to try to get around. They are very active and lovable dogs. Follow you and Happy Tails Spa with snarkymiss at live dot com. What's not to love? I love that she just accepts me now (She was a rescue and a bit jumpy when she came to me) and is obviously happy to see me after I come in, even if I've only been out for 1/2 hour. She's just pleased to be with me. On the off chance that you should take out a quick credit despite the fact that there aren't any loan specialists in your general vicinity, you may need to go to the nearest state line. Now and again, you can really cross into another state where payday advances are lawful and get an extension advance there. Continuously take a gander at a payday advance as your last choice. Indeed, even loans from Mastercards can cost not exactly in enthusiasm than that of a payday credit. Consider requesting a progress at work or acquiring cash from a relative or dear companion. Some ruthless loan specialists utilize swell installments to cover the genuine weight of the financing. This could compel borrowers to move over the advance into another understanding. The borrowers then wind up paying more in premium charges than the money they at first obtained. This is a bad dream circumstance that ought to be dodged no matter what. Before settling on a specific organization, doing your exploration is vital. There are various organizations, for example, Legal Advance Funding, that have been in the business for quite a while and have great notorieties. Some of them offer their administrations across the country while different concentrate on particular regions or urban communities.